Last month 20,000 dead fish had washed ashore with maybe five times more are at the bottom of the sea, local fishermen blamed an oil spill and Corexit. The source said the discharge line which pumps crude from Platform 17 to Trinmar's Tank Farm is located about four miles from shore. It is uncertain what caused the line to leak but speculation is rife that the offshore infrastructure was in dire need of upgrade. Already two leaks have been plugged close to Trinmar's S-20 platform by Petrotrin personnel which caused a shutdown of fishing operations along the villages of Bamboo, Bonasse, St Marie, Bois Bourg, Granville, Icacos and Fullerton. More than 1,200 fishermen and their dependents are relying on Petrotrin to provide compensation. Some of the fishermen said they lost more than two weeks of work because of the spills. Weeks before the oil spill became public, thousands of dead fish began washing ashore on the western coastlines. Contacted yesterday, president general of the Oilfields Workers' Trade Union Ancel Roget said he did not have details of the oil spill but will investigate. President of the Icacos Fishing Association Esook Ali said the entire fishing industry was closed down because many people have stopped buying fish. He said although the oil spill was minor, hundreds of fishermen were facing hardship. In response, Petrotrin's communications manager Gillian Friday acknowledged that there was a leak. "On Friday, August 19th while conducting routine field checks, a leak was observed on one of our platforms in our marine operations. Corrective actions were taken by operations personnel and the situation has been normalised. The Environment Management Agency and the Ministry of Energy and Energy Industries were informed. 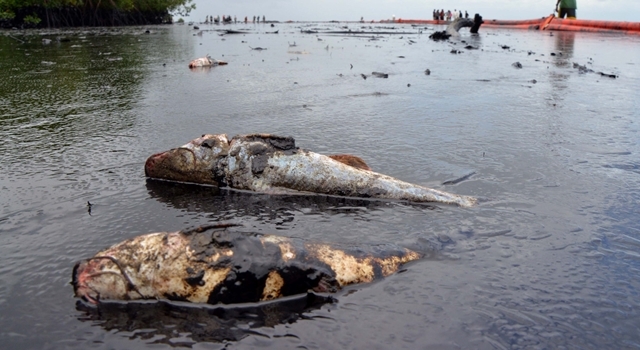 Shoreline checks revealed that there was no oil sighted along the beaches. In an earlier statement, Petrotrin said it was continuing to maintain constant vigilance and surveillance of all its land and marine installations. The company denied that chemicals were used in the cleanup, saying that primarily the use of absorbent materials achieved restoration of the affected areas. It also said it will continue to hold discussions with the fishermen and will work with them to resolve their issues.